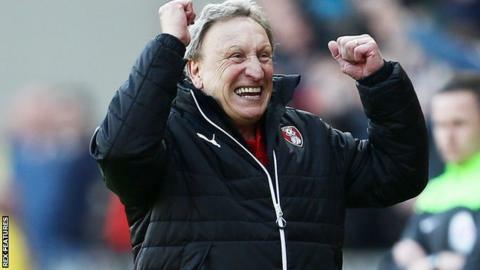 Rotherham United boss Neil Warnock has said he believes he is the best manager in the Championship. The 67-year-old took charge of the Millers in February after Neil Redfearn was sacked and has guided them towards a position of safety. Warnock has been promoted to the top flight three times in his career. "I don't think there is anybody else who can touch me at this level. My record is as good as anybody's," he told BBC Radio Sheffield. "I have got to show the lads what I want and why I have been successful and they have got to come on board and they have done. "When I came here I said 'you know how old I am and you know how many games are left and I have not come here to get relegated'. They have taken it on board and they have seen that we can move mountains and it is possible to achieve the unachievable." Warnock, whose contract runs out at the end of the season, says he intends to continue managing next season. He has spent the majority of his managerial life in the Football League but guided Sheffield United and QPR to the Premier League and spent a brief period in charge of Crystal Palace last season. The former Leeds and Huddersfield boss said he did not really like managing in the top division. "I know what I want at this level and I think the Championship is my level," he said. "I've been in the Premier League three times and I didn't really enjoy it. Financially it's great but I didn't enjoy the day-to-day and the organisation."